There is a unique ocean front lot in the heart of Cabrera, walking distance to the supermarkets, restaurants, bars , Malecon and main square.The lot is special since is right on the water and part of it sticks out on the ocean giving a all around view of the ocean. Also it is the only piece of Real Estate of this kind in the whole town of Cabrera. There are new ocean view lots are in the heart of Cabrera, walking distance to the supermarkets, restaurants, bars , Malecon and main square.These lots are on a dead end street and they are for those looking to live or invest in town in the best and most peaceful side of town. You can walk a few meters and the ocean is there, there is always a nice breeze going through. There are new ocean front development in the heart of Cabrera, walking distance to the supermarkets, restaurants, bars , malecon and main square.These lots are for those looking to live or invest in town in the best and most peaceful side of town. You can walk a few meters and the ocean is there, there is always a nice breeze going through. This lot is located on the lush green hills of El Breton , about 10 minutes from the center of Cabrera.There is a nice community with neighbors from different parts of the world. This lot is for those who love to live in the countryside and have a small budget.This property is surrounded by hills and trees , there is a small town walking distance where you can find grocery stores and other items.There are many tropical beaches 20 minutes away, like La Entrada and Diamante. This land is optimal for an eco-touristic development. It's a nice green slope going up to the highest point in the area with a breathtaking ocean view.It's very close to Playa Grande , 10 other tropical beaches and close to rivers and waterfalls.There is another land adjacent for sale next in case extra land is neededEasy access. This is a unique opportunity to own a ocean front and access to a small beach without spending millions!! !This spacious house with 3 bedrooms and 2 bathrooms has an immense potential since the location is second to none! whoever buys this property can build a second floor and have an amazing villa. This farm has everything perfect:Perfect conditions: super clean and the best grass possible for cattle , you won't find one bad weed in the whole farm. The farm is fully set up for the cattle business.Employee's housingYou can also drive through the entire property.Perfect location: Only 8 minutes from the main highway . 15 minutes to Playa Grande. multibillion villa development nearby. 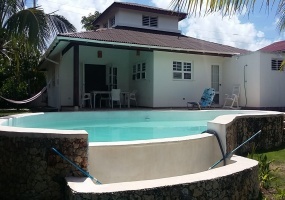 Cute Condo , very peacefulThis comfy condo is located in the green hills of La Catalina 5 minutes from Cabrera.There are beautiful gardens all around, more than 15 beaches in less than 10 minutes.